Heat oven to 350°F. In small bowl, stir flour, baking powder and salt. In large bowl, beat granulated sugar, softened butter, ricotta cheese and lemon peel with electric mixer on medium speed about 1 minute or until fluffy; scrape side of bowl. Beat in eggs, one at a time, just until smooth. Stir in vanilla. On low speed, beat flour mixture into sugar mixture until well blended. Cover and refrigerate 30 minutes. Using floured fingers, shape dough into 54 (1-inch) balls; place 2 inches apart on ungreased cookie sheets. Bake 9 to 11 minutes or until set but not brown. Cool 2 minutes; remove from cookie sheets to cooling rack. Cool completely, about 15 minutes. In small bowl, beat powdered sugar and 3 tablespoons lemon juice with spoon until smooth and spreadable. If frosting is too stiff to spread, add additional lemon juice, 1 teaspoon at a time. Tint with food color. 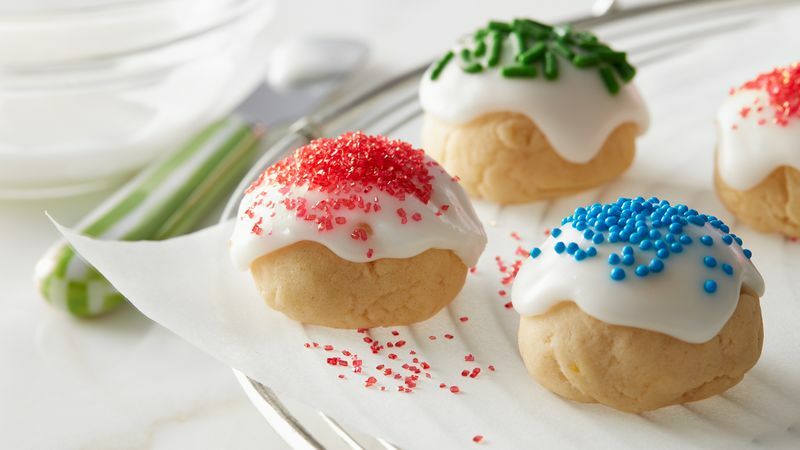 Using knife, spread 1/2 teaspoon frosting on each cooled cookie; immediately top with sprinkles. Let stand about 30 minutes or until frosting is set. Store covered in airtight container at room temperature. Ricotta cookies with lemon are a traditional Italian Christmas dessert. Whole milk ricotta is recommended for success of this recipe. For even baking, make sure cookies are the same shape and size. When the standard sugar cookie just won’t do, these Italian-inspired sweets are sure to surprise everyone with their smooth texture and bright — just a little tart, not-too-sweet — flavor. There are two secret ingredients that make these cookies something a little extra special: ricotta and lemon peel. The grated lemon peel, rather than being bitter, adds a sunny dimension to the flavor that notches back the sweetness of a sugar cookie without overwhelming it. Ricotta, a soft Italian cheese, is mild and creamy, not salty, and its addition to the dough yields a texture that’s silky and melt-in-your-mouth tender. Be sure to check the label on your ricotta when purchasing it — using a whole-milk variety is crucial to the success of this recipe. Whether you’re making these Italian Christmas cookies for the holiday or any day of the year, be prepared to share the bountiful yield of 54 cookies. If you’re looking for more ways to travel through Italy without leaving your kitchen, try out some of our other Italian cookie recipes, which include everything from bocconotti to biscotti! And to keep your baking on track and turning out tray after tray of perfect cookies this Christmas, dive into all of Betty’s tips, tricks and recipes.